Integrations for Facebook Chatbot happen through a quick Inbenta plugin, giving your customers a real-time, human-like chat right from your very own Facebook page. 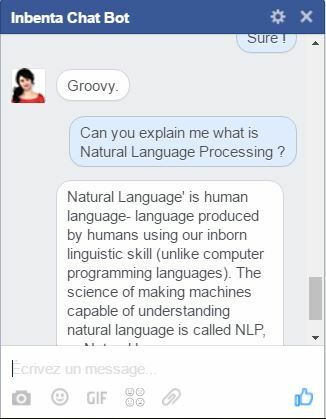 No more complex development, just a super simple way to brand and activate your chatbot. Connect with customers on Facebook Messenger. With billions of people on Facebook, having a chatbot makes perfect business and social media marketing sense. Beyond providing your customers with a powerful new support option, our easy to integrate plugin equates to a giant step ahead of the competition, for many of whom a Facebook page is a set it and forget it. Hybrid chat technology, with live agent option. The Facebook Chatbot is designed to engage your customers through either a self-service support experience where, if they’re not satisfied with an answer, the chatbot instantly moves the customer to a live agent who already has a detailed history of the Messenger chat. In both cases, your customer comes away with the outcome they want. And Inbenta Backstage Analytics tracks every bit of data along the way. Effortless setup, easy to use, instant answers.